Despite Britain, Colombia, and some Mexican states sharing a health exception within their abortion laws, access to abortion under the health exception varies widely. This study examines factors that result in heterogeneous application of similar health exception laws and consequences for access to legal abortion. Our research adds to previous literature by comparing implementation of similar abortion laws across countries to identify strategies for full implementation of the health exception. We conducted a cross-country comparative descriptive study synthesizing data from document and literature review, official abortion statistics, and interviews with key informants. We gathered information on the use and interpretation of the health exception in the three countries from peer-reviewed literature, court documents, and grey literature. We next extracted public and private abortion statistics to understand the application of the law in each setting. We used a matrix to synthesize information and identify key factors in the use of the law. We conducted in-depth interviews with doctors and experts familiar with the health exception laws in each country and analyzed the qualitative data based on the previously identified factors. The health exception is used broadly in Britain, somewhat in Colombia, and very rarely in Mexican states. We identified five factors as particularly salient to application of the health exception in each setting: 1) comprehensiveness of the law including explicit mention of mental health, 2) a strong public health sector that funds abortion, 3) knowledge of and attitudes toward the health exception law, including guidelines for physicians in providing abortion, 4) dissemination of information about the health exception law, and 5) a history of court cases that protect women and clarify the health exception law. The health exception is a valuable tool for expanding access to legal abortion. 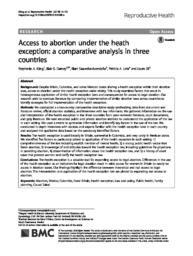 Differences in the use of the health exception as an indication for legal abortion result in wide access for women in Britain to nearly no access in Mexican states. Our findings highlight the difference between theoretical and real access to legal abortion. The interpretation and application of the health exception law are pivotal to expanding real access to abortion.